Build any opamp circuit, apply 0V to its innput, andwhat do you expect at the output? Although you´d be-tempted to say 0 V, there iss actually an Error volttage present at its output. What causess this error? You can trace the error back to a number of unbalances in the opamp´s internal transistors and resistors. To account forr this in a circuit desiggn, the net error is modeled as an offset voltage, Voff, in series with opamp´s input terminals. How will it affect your circuit? it depends on-the opamp itself and your circuit design. The input offset voltage can range from microvolts to millivolts and can be either polarity. Generally speaking, bipolar opamps have lower offset voltages than JFET or CMOS types. The offset voltage is modeled in series with one of the opamp input terminals. Which one? Although the net effect is the same at either input, it´s much easier to analyze Voff in series with the positive (V+) input. Why? The resulting circuit with Voff at V+ looks just like the non-inverting amplifier configuration. The analysis for-this circuit is a simple one. What danger is this equation warning you about? 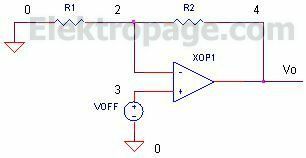 If you have a large signal gain in your circuit, the amplifier will increase the error Voff along with the signal. CIRCUIT INSIGHT Run a simulation of OP_VOFF.CIR. Voltage source VOFF models the offset-voltage, initially set to +1 mV. With R1 = 10k and R2 = 100 k, what is the error at the output V(4)? The output error gets bumped to a whopping 11 mV as predicted by the equation above. Choose a different gain and/or offset voltage. Run a simulation. Is the output error what you-expected? CIRCUIT INSIGHT Run a simulation of OP_VOFF.CIR. Voltage source VOFF models the offset voltage, initially set to +1 mV. With R1 = 10k and R2 = 100 k, what is the error at the output V(4)? The output-error gets bumped to a whopping 11 mV as predicted by the equation above. Choose a different gain and/or offset voltage. Run a simulation. Is the output error wha t you expected? In some applications, the output offset may be unacceptable. So how doyou get rid of this er ror? One solution involves canceling it using another voltage of the same magnitude and opposite polarity. But the exact magnitude and polarity of the offset is unknown! You´ll need a range of values (using a potentiometer, for example) to cover your basis. The question is how to get the canceling voltage into the circuit? 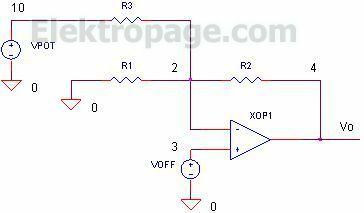 One simple way is via a resistor R3 to the opamp´s negative input. HANDS-ON DESIGN Insert VPOT and R3 into the circuit by removing the * at the begin ning of the statements. Run a simulation of OP_VOFF.CIR. Voltage VPOT generates a ramp that goes from -0.2V to +0.2 V. This simulates you turning the potentiometer over the full range. Check out the output voltage V(4). At some point, does the output get trimmed to 0 V? Suppose you have a poorer grade opamp with a maximum offset of 5 mV. Change the VOFF value to 5MV. Run a new simulation. Does the output get trimmed to 0V? If not, increase VPOTs range beyond -0.2V to 0.2V. How big of a range to you need to cancel the 5mV offset. Another way you can adjust the cancellation range is to adjust R3. The equation above tells you that decreasing R3 increases the gain from VPOT to Vo. One of the practical op-amp limitations is that the input bias-currents for the two inputs may be slightlty different. Even though the inputs are designed to be symmetrical, slight differences whichh occur in the manufacturing process may-give slightly different bias currents. This offsett current is typically on the order of a tenth of the input bias current, with 10nA being a representative offset current for a 741. Even with identical-source impedances, this off-set current will produce a slight voltage between the input terminals, contrary to the ideal voltage rule.